Just about every gamer has played or, at the least, heard of Valve's highly successful video-games 'Portal' and 'Half-Life'. Both video games have received impressive reviews from critics, with each having a score of 9.4+ out of 10. But, can a film adaptation really capture the spectacular story and gameplay of these two video games? J. J. Abrams and Valve's CEO, Gabe Newell, say yes! Half-Life- a PC video game series developed by Valve and published by Sierra and Vivendi Games, takes place inside a science fiction alternate history during 1998 at the fictional 'Black Mesa Research Facility' in New Mexico. The main protagonist, a recently hired theoretical physicist, Gordon Freeman took part in an experiment to research an unknown crystalline artifact. The experiment began the events, that span from Half-Life to its sequel Half-Life 2, by creating a dimensional rift that connected Black Mesa with another world called Xen, which ultimately led to a swarm of monsters entering through the rift and killing many of the facility's personnel. As a result of the dimensional rift opening, the government deployed elite members of the military to prevent any knowledge of the experiment from being released. The elites objectives were to kill anyone involved, even killing those oblivious to what had occurred. The events that developed from this experiment have the player, Gordon Freeman, fight for his life and ultimately transport to the other world. As the player continues on an action packed adventure through Black Mesa and Xen, all of the events result in Gordon Freeman looking up at a strange man in a suit and briefcase. Impressed with Gordon's work, offers him a job opportunity thus starting the story to Half-Life 2, taking place long after the dimensional rift being opened. Portal- A puzzle-platform series, also developed by Valve, features a woman named 'Chell' that is forced through a series of tests inside the Aperture Science Enrichment Center, a direct competitor of the Black Mesa Research Facility due to it's discovery of portal technology. The game also takes place in the same universe as Half-Life. The player, as Chell, must solve puzzles, wielding the Handheld Portal Device, which are administered by a psychotic, rogue artificial intelligence named 'GLaDOS'. Solving a variety of puzzles using the Portal Gun, the player advances with the help and advice of GLaDOS, whose motives become more sinister than helpful as the game progresses. As the player solves each stage, they come closer to finally confronting GLaDOS in person to discover the real motives behind being trapped inside the facility and being force to solve puzzles . After the confrontation with GLaDOS, the player is eventually being dragged away by a unseen entity with a robotic voice leading to the events of Portal 2. With the unique elements of each game, a movie would seem incapable of recreating the feeling players had while playing the games. Also given the fact that neither Gordon Freeman or Chell have speaking words through-out their adventure makes a film seem impossible to write. It was initially assumed by the public that these rumors were a mere joke, but it turned out to be very real. J. J Abrams, director, producer, writer of TV series and movies that include Armageddon, Lost, Cloverfield, Super 8, and future director of the highly anticipated Star Wars: Episode VII, put to rest speculation of Portal and Half-life becoming movies. Announcing in early 2013, Abrams had confirmed the plans and collaboration between himself, and Valve's CEO Gabe Newell, saying 'We are really talking to Valve, we are going to be bringing on a writer, we have a lot of very interesting ideas.’ Though this didn't sit well with many Half-Life and Portal fans. Many fans of both game series are uneasy about the idea of either game becoming major full-length films, including myself. The announcement was followed by joy, but quickly evolved into apprehension amongst fans. Converting the story and gameplay of both Portal and Half-Life seems near impossible, as well as being able to pull it off with ratings and reviews that parallel what the two series received on their own. Portal and Portal 2 received scores of 8.2 and 9.5 ,out of 10, respectively. Half-life and Half-Life 2 achieved outstanding ratings of 9.5 and 9.7, a feat of extraordinary difficulty as very few games have been rated as high. The fear that these films will fall very short in comparison to the games is very high. One of the main reasonings for these reactions towards Portal becoming a film is the simple fact that the game features no speaking roles for the main character, only a few crazed A.Is, along with the gameplay and story being very linear. How Abrams and Newell will recreate Portal into a film is anyones guess. Abrams was quoted saying, towards both games, 'We’re not looking to make a movie in the gaming world, we’re not looking to impose what we do on that, we’re looking forward to taking some of our strengths and collaborating with some of these incredible minds that make some of my favourite games'. Gabe Newell himself has always vetoed any Valve's productions into becoming a movie, for reasonings stated above. Regardless of his past denial, Newell feels very confident that the end productions will be highly succesful with J. J. Abrams. In-fact, both are possibly collaborating to make a future video game together, one that explores 'the limits of gaming in a perfect way'. The thought of these two people of extraordinary talent coming together to create a new video game is pretty exciting and I personally can't wait to see what will come from this. Though, the thoughts of Portal and Half-Life: The Movie strike uncertainty in me as I am still sitting on the fence for whether it can be done, and skillfully. Two highly succesful, critically acclaimed games that are known for their gameplay and storylines being confirmed for future films. People are divided on their opinion on how these will turn out, will it be a hit? Will they be a complete flop ? What is your perspective on this major movie announcement and how do you feel about both series coming to the silver screen? 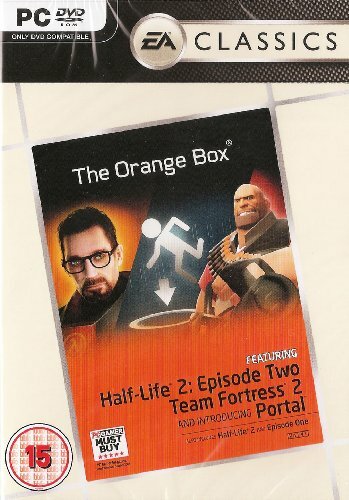 If you have yet to play the Half-Life series or Portal series, I highly recommend purchasing the 'Orange Box' which contains both Half-Life and Portal. It also includes another highly succesful Valve creation, Team Fortress 2.